Betsy DeVos, who is about as qualified to run the Department of Education as Homer Simpson, might not sail through her confirmation hearings as easily as her similarly inexperienced peers appear to be doing. But actually, haha jk, she probably will. 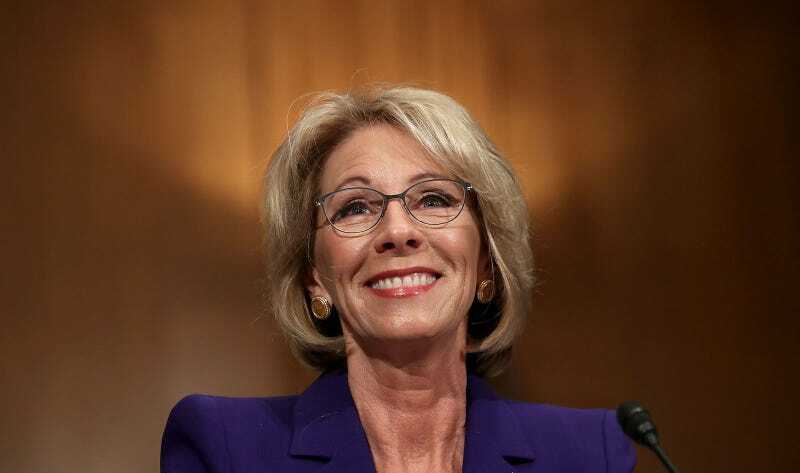 DeVos is a GOP billionare donor who has zero education policy experience, thinks guns may be required in schools to fight “the grizzlies,” and is a school voucher fanatic who critics fear will privatize public education. Sen. Al Franken (D-Minn.) called DeVos an “ideologue” and has promised that no Senate Democrat will vote for her. Republican Senators Susan Collins of Maine and Lisa Murkowski of Alaska have broken from the party line and pledged to vote against DeVos’s final confirmation. “I will not, I cannot vote to confirm her as our nation’s next secretary of education,” said Collins. DeVos wins by a simple majority. There are currently 48 Democrats and 52 Republicans in the Senate—51, soon, if Alabama Sen. Jeff Sessions is confirmed as attorney general. However, CNN’s Manu Raju is reporting that Senate House Majority Leader Mitch McConnell will postpone the vote on Sessions until after DeVos’s vote, specifically so that Sessions can pull Republicans in to a 50-50 tie. In the event of a tie, the decision would fall on Vice President Mike Pence (and I think we can all guess what he will choose). Democrats still need one more Republican to defect in order to block DeVos’s confirmation. Republican officials are confident DeVos will be confirmed. Unless Americans can get through to one more Republican senator, prepare to weep for our public schools.